La fiel compañera de tarzan, la mona Chita cumplió 75 años el pasado 11 de abril, manteniéndose como el chimpancé más longejo del mundo, una especie que suele vivir hasta los 40 años, pero que en cautiverio llega normalmente hasta los 60. 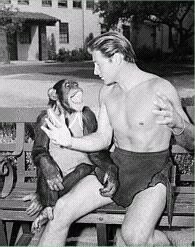 Chita es el nombre por el que más se conoce a Jitts (9 de abril de 1932), el chimpancé que interpreta a la mona Chita en las películas de Tarzán interpretadas por Johnny Weissmuller en los años 1930. Chita aparece en cuatro de las películas de Tarzán interpretadas por Johnny Weissmuller: Tarzán y su compañera (Tarzan and His Mate, 1934), Tarzan Escapes (1936), Tarzan Finds a Son! (1939) y Tarzan’s New York Adventure (1942). Posteriormente, Chita también participa en Doctor Dolittle (1967). Y aún realizaría algunos anuncios y participaría en algún telefilm antes de retirarse dignamente del mundo del espectáculo. La mona Chita está bajo la custodia de Dan Westfall desde 1992, después de pasar la mayor parte de su vida con Tony Gentry, un conocido entrenador de animales que trabajó en Hollywood y que encontró al chimpancé en África en los años 30. 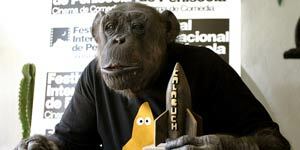 Coincidiendo con su 74º cumpleaños, Chita recibió el único galardón cinematográfico de toda su carrera, otorgado por el Festival Internacional de Cine de Comedia de Peñíscola (España) en el año 2006. Dato curioso, la Mona Chita, en realidad es un chimpancé macho, en lo personal no estoy de acuerdo con eso de utilizar estos animalitos para esos fines, ya que normalmente son maltratados y después de sacarle el jugo son abandonados, creo que Chita corrió con mejor suerte. epale, ese que aparece en la foto no es Aristobulo Isturiz? I’d have to admit with you one this subject. Which is not something I usually do! I enjoy reading a post that will make people think. Also, thanks for allowing me to comment! This post seems to get a great deal of visitors. How do you promote it? It offers a nice unique spin on things. I guess having something real or substantial to say is the most important factor. What I wouldnt give to have a debate with you about this. You just say so many things that arrive from nowhere that Im quite certain Id have a fair shot. Your blog is fantastic visually, I mean people wont be bored. But others who can see past the videos and the layout wont be so impressed with your generic understanding of this subject. Nice post . Cheers for, visiting this blog page mate. I’ll message you soon! I didn’t know that! A splendid blog post, I just given this onto a friend who was doing a little research on that. And he in fact bought me breakfast because I found it for him. smile. So let me rephrase that: Thnx for the treat! But yeah Thnx for taking the time to talk about this, I feel strongly about it and enjoy reading more on this topic. If possible, as you become expertise, would you mind updating your blog with more details? It is highly helpful for me. Two thumb up for this post! Superb short and this article solved the problem alot. Say thank you We searching for your own information…. I get excited by computer games. Facebook games are pretty good a lot of the time. Sometimes they’re pretty lame. I really enjoy playing computer games. FB games are good most of the time. Sometimes they’re sort of stupid. Thank you so much for this! I haven’t been this moved by a blog for a long period of time! You’ve got it, whatever that means in blogging. Anyway, You’re definitely someone that has something to say that people need to hear. Keep up the good work. Keep on inspiring the people! It’s rare for me to discover something on the cyberspace that is as entertaining and fascinating as what you have got here. Your page is lovely, your graphics are great, and what’s more, you use source that are relevant to what you are talking about. You are certainly one in a million, great job! said here tells us view of the topic. knowledge, i love to read articles that educational helpful in nature. gives you a realistic look at the situation. published it, i love to read articles that are informative effective in nature. Thank you so much for this! I haven’t been this moved by a post for a long period of time! You have got it, whatever that means in blogging. Well, Youre definitely somebody that has something to say that people should hear. Keep up the great work. Keep on inspiring the people! Thanks so much for another wonderful. find stuff like this noticed friend, and basically. You’re not the average blog author, man. You certainly have something powerful to add to the net. Such a outstanding blog. I will return for more. Hey, nice site. I came across this on Bing, and I am over the moon that I did. I will definately be coming back here more often. Wish I could add to the post and bring a bit more to the table, but am just taking in as much info as I can at the moment. Hey, very nice website. I came across this on Google, and I am happy that I did. I will definately be revisiting here more regularly. Wish I could add to the info and bring a bit more to the post, but am just taking in as much info as I can at the moment. I just have high hopes this does not seem a mindless question. Nevertheless after reading your subject material I’m somewhat lost. Just what were you looking to communicate right here with this?? Good informations the following ! Did you search for and come across these on your personal or is there a source website link I can go to check out other folks? Nice post man! I was just looking this up on Google and I came across your site! I was happy to search out this particular web-site.I want to to thanks for your effort for this amazing learn!! I definitely having fun with every single little this and I had you book-marked to see fresh thing you blog post. 54. Hello, Neat post. There is an issue along with your site in web explorer, might check this¡K IE nonetheless is the market leader and a huge element of other folks will omit your great writing because of this problem. The backside line is to create a web page which is greater than your competitors and appeals to the site’s users adequate for them to take a desired action. Awesome data, quite a few cheers for the author. Establishing efficient one-way hyperlinks is all about obtaining folks interested. Believe of real-life experiences or facts concerning a individual or product. Be a portion of a organization team dialogue and share which you realize. It could suggest you can possess really crucial interaction thus having links for your personal hyperlinks. a thirty foot drop, just so she can be a youtube sensation. My iPad is now broken and she has 83 views.